Since 1900, the Lang family has been caring for the rugs of countless families in Wilmington, Delaware and the entire tri-state area. Although Lang Carpet is located in Wilmington, Delaware, we do carpet installation and rug work throughout the region including The Delaware Beaches, New Jersey Shore, Eastern Maryland Shore, Annapolis, MD. For inquiries, visit our showroom or give us a call. This image features a flat woven stair runner that was custom installed. 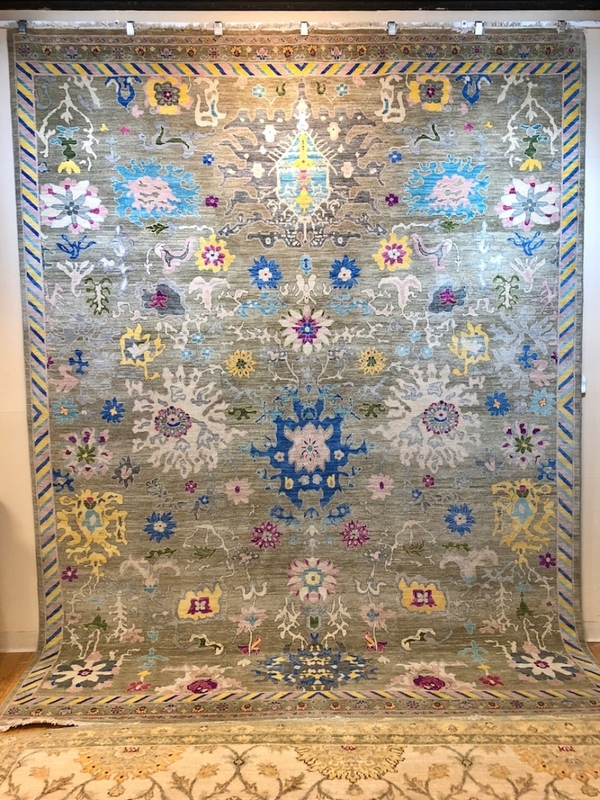 In our 4,000 square ft retail showroom, Lang Carpet offers an extensive variety of rugs and flooring products, which include but are not limited to designer wools, fine hand-made oriental rugs, luxury vinyl tile, and new carpeting. We have at our disposal the finest carpeting and rugs produced throughout the world, allowing our customers to have the newest styles, patterns, and colors. Our experienced staff will guide you through the selection and installation process to create a beautiful space in your home or office. This is a picture of one of our team members cleaning an area rug in our in-house rug cleaning facility. Our dedicated Lang team has been committed to exceptional service since our founding in 1900. We continue to offer the highest quality work through our countless services including area rug cleaning, in-home wall-to-wall carpet cleaning, carpet and rug repairs, new carpet installations, and a full-service carpeting and oriental rug retail showroom. With over 118 years of experience in the carpet and rug industry, the Lang team is highly knowledgeable about the care and preservation of your rugs. This picture is of our Lang Carpet front door. Our honorary sheep mascot is in the window. Starting with our founder and namesake, George F. Lang, Lang Carpet has been in the Lang family for over 118 years, and is now in its 4th generation of Lang ownership. Since 1900, the Lang family has been caring for the rugs of countless families in Wilmington Delaware and the entire tri-state area. 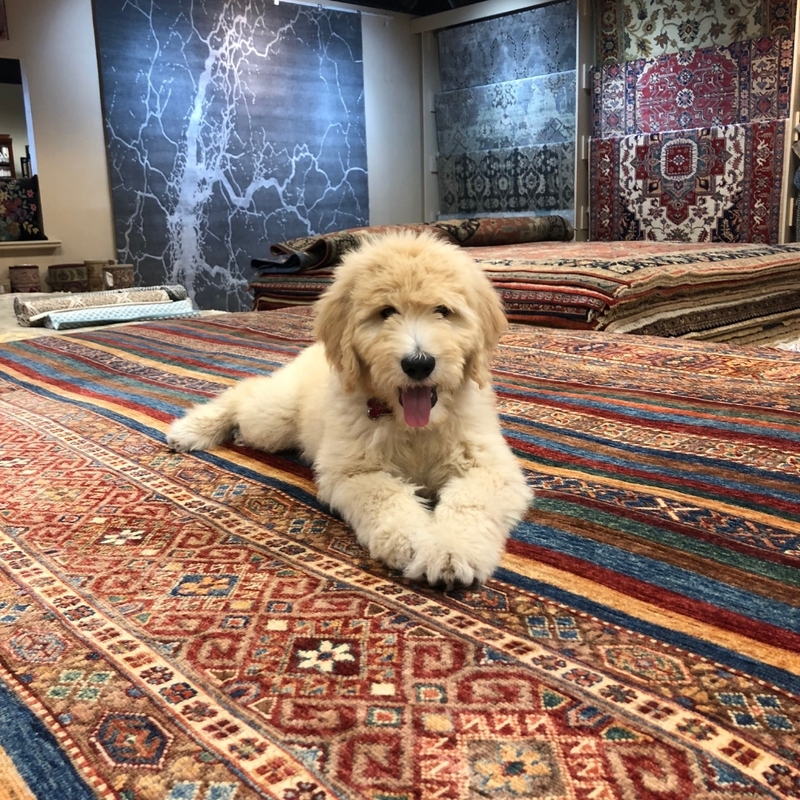 Since our founding as a rug cleaning company, we have expanded to a full-service retail carpet and rug showroom, offering installation and custom design. If you'd like to warm up your floors with the latest colors, textures and patterns with either wall-to-wall installation or area rugs, our vast selection gives you exciting choices you can enjoy in your home. With access to major manufacturers, niche mills, and endless custom possibilities, we can provide the perfect rug or carpeting for every application, including custom design, fabrication and installation. Some of our beautiful hand-made oriental rugs. Our office puppy, Charlie, modeling for a photo. Oriental rugs on display in our expansive showroom. We take great pride in our work at Lang Carpet and our customers' satisfaction is our top priority. By combining our extensive product selection and top-quality craftsmanship, Lang Carpet strives for excellence in each and every job we complete. This is an elegant, gold sisal area rug that we made custom-made for our customer in our on-site carpet workroom. We our located at 1001 N. Union Street, Wilmington, DE 19805. We are open Monday-Friday 8am to 5pm and Saturday 8am to noon. We are closed on Sundays. Do I need an appointment to bring in my area rug for cleaning? No, you do not need an appointment if you are bringing your rug into our facility at 1001 N. Union Street. In fact, we offer you a 20% discount on the cleaning of your rug when you bring it in and pick it up. We also offer pick up and delivery services, for which you will need an appointment. Give us a call to schedule at 302-655-1533. No, please come in anytime during our business hours. There is always someone here that can help you find what you are looking for.